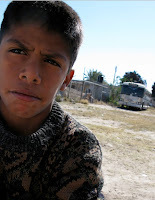 We recently returned from the slums of Northern Mexico, our next focus area. Yes, you heard me correctly: we are now getting involved in Latin America. “Why would an organization focused on Asian child soldiers go into a place like Mexico,” you might wonder? After all, there aren’t child soldiers there…right? The answer is complex and disturbing. If you have been keeping up with the sporadic news articles related to drug trafficking in Mexico, you already know that drug cartels are effectively expanding their control on local, national and international communities. Former Special Forces soldiers are organizing their gangs and training young hit men (and hit women) to carry out increasingly brutal campaigns of violence, and drug lords have built entire economies and pueblos (towns) around drug production and trafficking. Even so, our goal is not to vilify or speak ill of these cartels and gangs. In many cases, leaders within these groups do care quite a bit about the welfare of their communities, and if alternatives exist for children, they are open to exploring them. Since there are few to no alternatives for children in the slums, the gangs are employing boys and girls, even as assassins. They use younger children primarily as “hawks” to observe and report activity of interest, such as police and military whereabouts, suspicious persons, hit targets, etc. The older children make particularly effective assassins, though, especially the girls. They can access places and people that adult men cannot, and they get out of prison within a couple months because of lenient incarceration laws for offenders who are minors. So, while they are not soldiers in the classic sense, they are still waging war, many times armed with AK-47s. It’s unsettling enough to think about these problems in a distant Asian country, but this is all happening in our backyard. Not only is Mexico next door, but these organized gangs are already spilling across the border into U.S. cities as well. What we have ignored for decades is about to become impossible to ignore. So, what are we going to do about it? We are partnering with a small, local organization on the ground that uses highly creative means to give children and young adults alternatives to cartel, gang and drug involvement. We will reveal what this looks like soon, but we are very excited about the road ahead, and appreciate all support during this important time. NEW PROJECTS IN THE PHILIPPINES AND MEXICO.